2017 turned out to be another amazing year for us here at UncannyXMen.net as we churned out the new content that included an enormous character article on one of Marvel’s very first mutants. We dedicated a theme month to one of the X-Men’s most beloved sister-team's and we took the time to celebrate the numerous appearances of the X-Men on film and TV. In case you missed any of the content we published over the year here is a breakdown of it all to remind you. After taking some time over the festive period to enjoy real-life we kickstarted January with a look back on the previous years’ worth of articles on our UXN 2016 Year in review. Afterwards we decided to look forward and release the first of the year’s big articles, a spotlight on Pixie. Whilst she was relatively new to the X-Men world she had amounted a good number of stories and made a decent-sized article. As a tie-in to Australia Day (yes apparently that is a thing) we gave you an article on one of the very few Aussie’s to grace the pages of Uncanny X-Men…a spotlight on Pyro. With two big character articles under our belt we thought it best to dust off one of our older articles and bring it up to date. With that in mind the Acolytes villain team entry was updated to include their changing roster as seen in X-Men Legacy a few years back. Next, we chose to celebrate the fact that, after many years away, the X-Men were back on our TV screens. We gave you an update to Legion, the very man starring in his own amazing, live-action show (seriously check it out if you haven’t already). February also saw the release of some more characters that would make it into a TV show later in the year (more on that in October…). Maybe it was chance or maybe the writers read the awesome article and were inspired, but the villainous twins known as Fenris received their own character article. If that wasn’t, this month also saw the release of the blockbuster film Logan. Whilst we had only updated Wolverine’s spotlight a few months back we weren’t going to miss out on the film. So first up came an update to the X-Men’s cinematic timeline to take into account the recent instalment of X-Men Apocalypse. After that we updated Caliban’s spotlight as he had a significant role in the new film. Whilst February had an unintentional media-related theme to it we had bigger plans for March as we revealed that the month would be dedicated to one of the X-Men’s most popular sister-teams…X-Factor. Specifically, the Peter David era. The first release of the month was the first part of the X-Factor Investigations team entry, that dealt with the formation of Madrox’s team, as well as notable stories such as the Messiah Complex. To compliment this particular period of the team’s life we released an entry on one of Jamie’s most dangerous duplicate and villain for the team, Cortex. After that we released the second part of the team entry, chronicling the growing number on the team up to the end with the Hell on Earth arc. We couldn’t let the month slip by without updating at least one of the characters involved, and after some debate we chose Siryn as it also coincided nicely with St Patrick’s day. Following on from that we compiled an entry on the All-New X-Factor team, which went by the name Serval Industries. Wanting to end with a bang and honour the whole of X-Factor history we gave you a spotlight on one of the few members to feature in most iterations of the team…Val Cooper. It was that time of year again and for this year’s April Fool’s prank we gave you something many visitors had asked about for years. We debuted our very own companion site on Earth’s Mightiest Heroes with the release of MightyAvengers.net. However, it was all a prank and whilst the site existed, none of the content on it was real. After disappointing many people, we thought we would make it up to you by giving you an article on one of X-23’s former allies, Kiden Nixon. Taking a break from character-related content we released the next part of our ever-popular series with Publication History X 2011, which dealt with events such as the Age of X and Schism. Turning back to the character based articles we released one on Unit, the prisoner of SWORD who struck up an uneasy alliance with them and the X-Men. After that it was the first of the Alpha Flight entries for the year with an article on former-member-turned-villain Witchfire. When organising our schedule we realised we had a LOT of character articles lined up that had a similar theme to them. So in another unofficial theme for the year we ran with M for May. The first article was a quick-fire update on Marrow, who we last saw joining X-Force. With the series over we took the opportunity to get her up to date. The next article was on a character many had asked for and narrowly missed out on our Exiles month a few years back. With that in mind we gave you a spotlight on Morph, the mainstay of the dimension hopping team. To celebrate the release of the new series of Generation X we gave you another character article on a shape-shifter, this time it was Morph II. Finally we dusted off the images on Maggott’s spotlight and released him again, although very little has happened to him since his article was last updated. After a character heavy month we broke up the schedule a bit with our next Publication History X on 2012, the month that saw the Avengers go up against the X-Men and the debut of the Phoenix 5. Looking to more recent stories we updated the profile of Alchemy, the reluctant X-Man who died a few months before in the Death of X story. For our following article we posed the question as to who Marvel’s First Mutant was. Depending on how you look at the question there were a number of different answers. Next up, it was time to remember a hidden X-woman when we released the tragically short profile on Sway. Our final article of the month was timed to honour the 150th anniversary of Canada, so with that in mind we gave you a profile on Murmur III, one of the many Alpha Flight allies yet to be included on the site. Knowing that one profile wasn’t enough to celebrate Canada Day, we started off July with a profile on another strange Alphan, Manikin. With that out of the way we turned our attention to one of our older spotlights that was in dire need of updating…Colossus. He had only just come back to life when we visited him last so there was a LOT of ground to cover in the update. Since his article was so big we gave you time to get through it by releasing our next Publication History X on 2013, the year that saw the (re-)debut of the original five X-Men into the present day. Our final article of the month was five-for-the-price-of-one when we gave you a combined spotlight on the Stepford Cuckoos. August started off as business-as-usual when we gave you a profile on one of the newer X-students in Kid Gladiator. Following that was one of the few remaining Publication History X articles when we dropped 2014, the year Nightcrawler was resurrected and the Apocalypse Twins wreaked havoc. By now many of you were well-aware that August is the site’s birthday month and we weren’t going to let this one slip by quietly. We decided to forego a full-on event month like we have done in previous years, instead opting to release a spotlight. It was obvious that no normal character would suffice, so after months of hard graft Monolith wrote the spotlight on one of Marvel’s oldest mutants, Namor the Sub-Mariner. After that monumental release we thought it best to give you something light to read, so we updated the profile on Bird-Brain to take into account his appearance in the New Mutants title a few years back. September started with another update, this time on Banshee, who had recently been brought back to life thanks to the Apocalypse Twins. It was time for another Alphian profile and so it was the turn of Puck II, one of the only members of the team not to be resurrected after being killed by Omega. Having released a number of character-based articles in a row we broke things up with an alien races article on the Z’nox. It was back to characters for the rest of the month and the first of them was an article on Tarot, a frenemy of the New Mutants who can’t seem to decided if she should stay dead or alive. We ended the month on a bang with the release of a spotlight on one of the X-Men’s most enduring villains from the 90’s…Exodus. October saw the release of the second X-Men TV show of the year, X-Men: The Gifted. After seeing the cast list we quickly threw together some articles on character set to be featured in the show. The first one was on Beautiful Dreamer, the Morlock who could alter memories and who met a tragic fate a few years back. The second was on the villainous Ahab, who features on the show as a sinister scientist. We continued the month with more profiles, first of the short-lived Brotherhood member Phantazia and then on the mysterious Black Box. As Halloween descended upon us we took the opportunity to update the popular Death Chart to account for the loss of Cyclops as well as the resurrection of Nightcrawler and Banshee. A Publication History X on 2015 was the first article of the month, detailing the destruction of the 616 universe and the birth of a new one. After that it was time for a profile on one of the more confusing and underused members of Generation X, Mondo I and II. Next up we had another alien races article, this time on the Breakworlders who almost lost their planet to infighting. The last article of the month was another movie tie-in but only in a round-about kind of way. Thor: Ragnorak was topping the cinema listings all around the world and so we released an update on the X-Men’s honourary Asgardian, Moonstar. It was time to put a spotlight on the dead once again by releasing a joint profile on Bishop’s fallen allies, Malcolm and Randall. Next up was the Publication History X 2016, the final article of the series, bring us up to date (for a few weeks at least). The next release marked another important moment for the staff at UXM.net, the final spotlight update from our 2004 list. It has been a long endeavour to update all the older spotlights and their images, but with the release of Beast’s update we reached a notable milestone. We still have a long way to go yet but the end is in sight. More updates were on the menu for the rest of the month. First up we had one on the Frost Family Tree, addressing her relationship with the Stepford Cuckoos in greater detail. Next up was Abyss, who had finally appeared from the Brimstone Dimension we last saw him in. As mentioned, the spotlight updates are challenging to keep up with, so that’s why we try to keep on top of some of newer ones as well as concentrating on the older ones. With that, we updated Wolfsbane’s spotlight to detail the tragic events of the Hell on Earth arc as well as her recent appearances and new powers. Total for 2017 - 122 - That's an average of 0.33 releases a day! In March we altered our front page logo to reflect the X-Factor Investigations theme of the month. Well, we can assure you that there are BIG plans afoot for 2018 that are sure to blow your socks off. 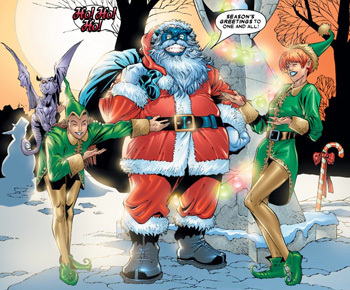 We will keep on delivering you brand new content as well as refreshing some of the older stuff to make UncannyXMen.net the best resource site for Marvel’s Merry Mutants. As always we are looking out for more contributors to the site. So if you think you can help us out with issue summaries, updating spotlights or even refreshing older images give us an email. Hope you all have an Uncanny 2018!